Tapu Bulu in game: 460 Who? Important notice! 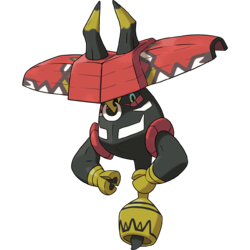 Pokemon Tapu Bulu is a fictional character of humans. Tapu Bulu (Japanese: ??·??? Kapu-Bulul) is a dual-type Grass/Fairy Pokémon introduced in Generation VII. It is the guardian king of Ula'ula Island. Tapu Bulu's body is black with several white markings. Its eyes have black pupils, blue irises with orange across the middle, and red borders along the bottom. It has what appears to be a golden nose, with a white ring running through its "nostrils". Its arms are thick and muscular, have red rings around the shoulders, and end in golden, cloven hooves. Its tail is mostly covered in a golden bell with black markings on it. Its shell is primarily red, with white and yellow markings thickly bordered by a muted black. On each half of its shell is a black, wooden horn with a yellow marking on its outer section. The shell itself resembles a flower or plant when open; when closed, it takes on the appearance of a bull. The guardian of Ula'ula Island is able to command vegetation to grow and change shape to its will; this includes its own wooden horns, which it often changes in battle. Despite its fearsome power, it is largely inactive, leading some to consider it a lazy Pokémon. It has a peaceful disposition and does not like to cause unnecessary violence; for this reason, it rings the bell on its tail to alert others of its presence. However, it is merciless to those who offend it; it is said to have once repelled thieves from its ruins by swinging trees like clubs. The ruined Tapu Village stands as another example of the guardian's wrath. 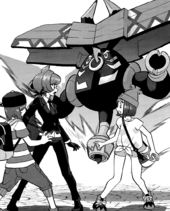 Tapu Bulu is first mentioned in the Sun & Moon chapter, by Nanu who discusses with the other Kahunas about the recent sightings of the guardian king. It pulls large trees up by the roots and swings them around. It causes vegetation to grow, and then it absorbs energy from the growth. The guardian king of Ula'ula is a lazy Pokémon. It commands plants to immobilize its foes and then deals them a savage blow with its horns. Moves marked with a superscript game abbreviation can only be bred onto Tapu Bulu in that game. 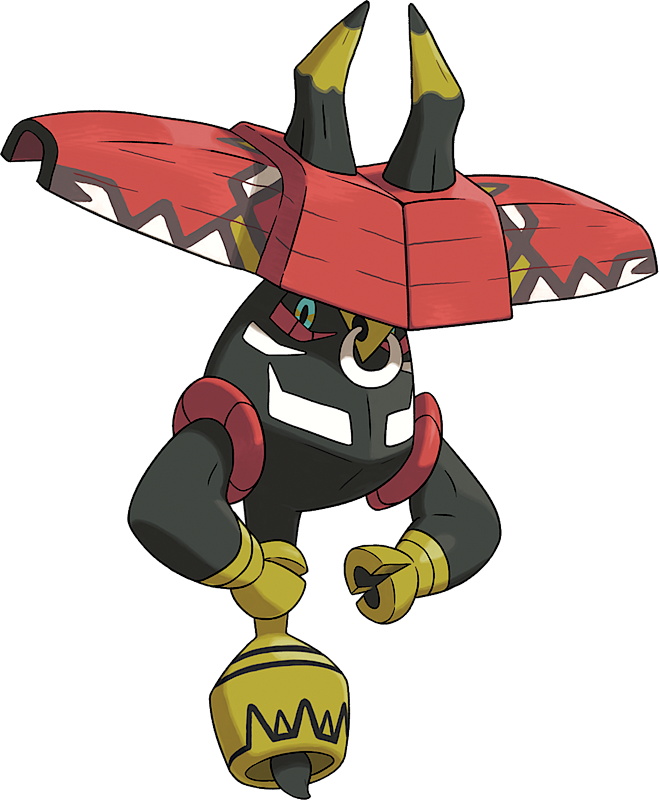 Tapu Bulu, with and without its shell closed, appears to be based on a bull. Tapu Bulu may be a combination of tapu (Hawaiian for sacred or holy) and bull. Kapu-Bulul may be a combination of kapu (Hawaiian for sacred or holy) and bull.